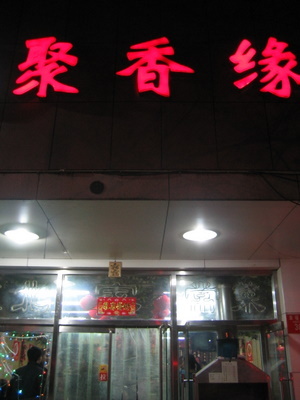 Before I went to China, my hair stylist recommended that I check out a chain of restaurants called “Dong Bei Ren”. Translated literally, this meant “North East People”. My hair stylist said he ate at this place every day when he went to China and its food was very different from what was available here in Vancouver. 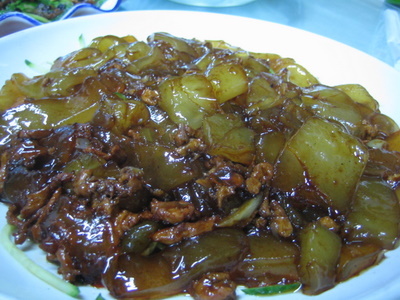 When I told my tour guide that I was interested in trying Dong Bei Ren, he recommended this other place that was closer to some of the sites we were visiting. It was a small family restaurant but was very busy and I would argue the best restaurant we visited while we were in China (or at least one of the top 3!). 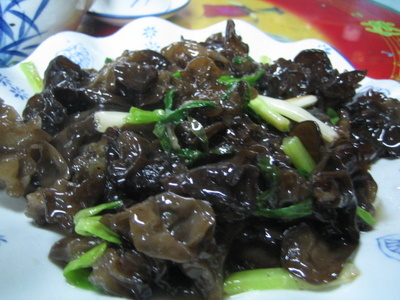 First came some stir-fried “wood ear” fungus, which is a famous dish in the north eastern region of China. It had a slightly tangy taste and a light crunch. Next came some lamb skewers. These were extremely good. 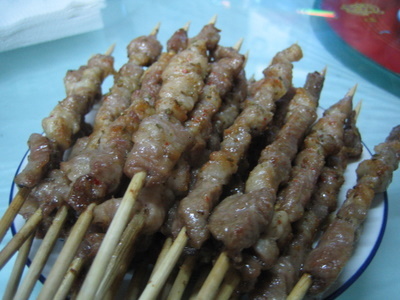 The skewers had a mild lamb flavour and did I mention they were really good? The lamb was very juicy and had some very spicy curry seasonings. Jenkins is not a huge lamb fan normally and he enjoyed this dish very much. These were actually grilled just outside the restaurant and had a great charcoal flavour. Just looking at this picture makes me start to drool. 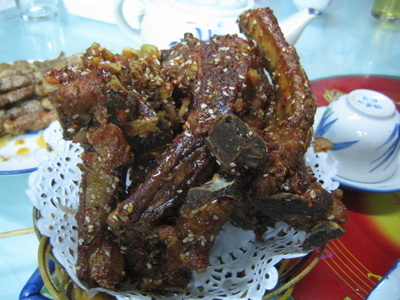 We also had some spicy pork ribs. The ribs were dry roasted with chilli, garlic, and onions. Similar to the lamb, the ribs were very spicy but extremely tasty. I can take quite a bit of spice but I had to temper the spice with some rice. One of the reasons we ordered this dish was because almost every table in the restaurant ordered it as well. 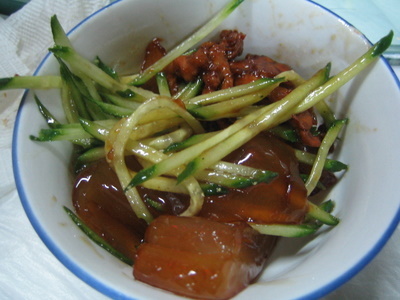 I grew up eating canned dace when I was little and this next dish kind of reminded me of those days. 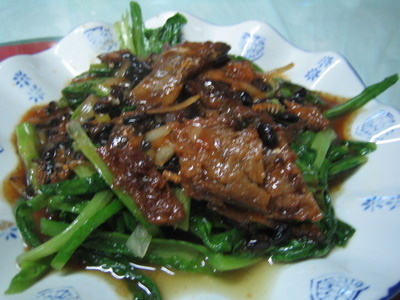 This dace cooked with black beans and served with some veggies. 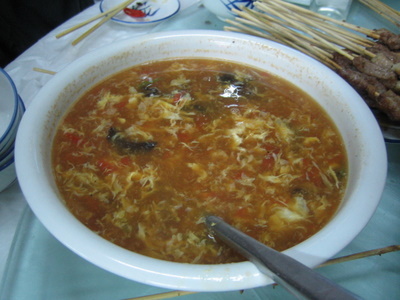 The hot and sour soup was not as thick as the one I usually have in Vancouver. It was just the right amount of spiciness and the big chunks of swirled eggs were a nice touch. I found it really easy to have several bowls of this soup because it wasn’t as thick as the hot and sour soup I was accustomed to…I guess it seemed less filling. I had never had anything like these thick potato rice noodles before but they were very tasty. The noodles had a chewy, glutinous texture and the entire dish had a similar taste to fried beef rice noodles although the texture was completely different. My only regret about this restaurant was that the chunky noodles came at the end, when I was completely stuffed already. If anyone knows of a similar restaurant here in Vancouver, let me know and I would be the first in line. This restaurant was definitely very popular with the locals and was packed with people, all with tables full of yummy food.